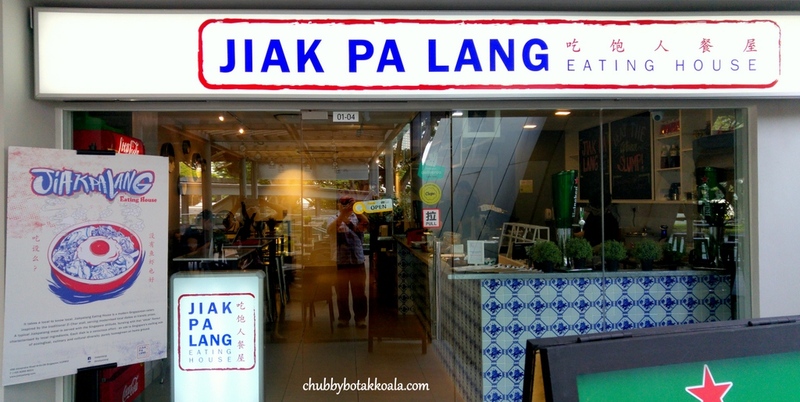 Jiakpalang is a Hokkien word referring to a person that ate to his fill. Not a Hokkien myself, I just find the restaurant name to be catchy. 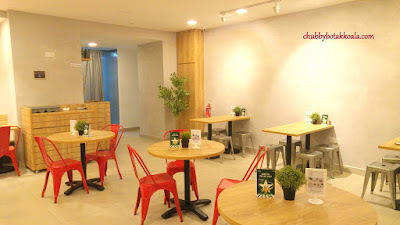 Jiakpalang Eating House is the latest venture by Executive Chef Nixon Low. A home-grown Singaporean Chef who has cut his teeth in the top fine dining restaurants and elevate the reputation of Portico Group. The first time I saw Chef Nixon Low, I compare him to Chef Robert Irvine from Food Network due to his muscular build. Inspired by the local flavours he grew up with and enjoy, Jiakpalang is showcasing Chef Nixon creativity in blending local flavours with modern cooking technique. Known as Modern Singapore cuisine. 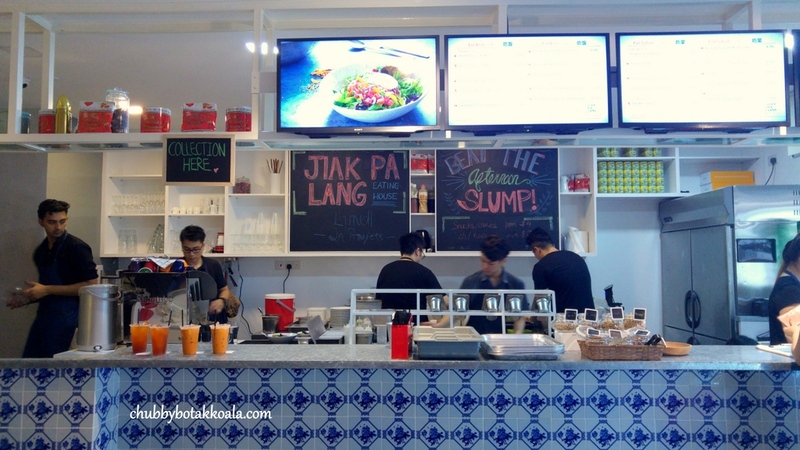 In the afternoon, Jiakpalang served a one bowl meal like Signature Sesame Soy chicken ($6.90). It is brown rice topped with sous vide chicken breast, with sesame soy dressing and woodear mushrooms. Well to make it more 'atas' there is fresh pomegranate, an onsen egg and steamed vegetables, to sum it up deliciously healthy version of Singapore “Chap Chye Peng” mixed vegtable rice. It is definitely value for money and no wonder the office crowd flocking Jiakpalang during their lunch hour. 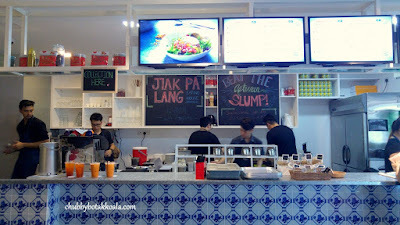 From 1st week of August, Jiakpalang has commenced their dinner service. We sampled the Appetizers of Silken Tofu, Century Egg Sauce, Tobiko ($7) and Sour Plum Vine Tomatoes, Seaweed (v)($7). The chilled silken tofu is smooth and creamy, topped with creamy finely chopped century egg sauce. Tobiko adds crunchy popping texture with salty flavour to this dish. The chopped pickled ginger balance this dish nicely and remove any jelakness that you can have with the century egg. Sour Plum Vine Tomatoes are marinated for 24 hours with tomatoes, sour plum, sugar, salt and pepper. This marination seems to intensify the flavour of the tomato. Since the dish is served chilled with seaweed salad and roasted sesame sauce, it tasted tangy and refreshing at the same time. A good dish that wakes up your appetite in anticipation of what comes next. Cream of Dried Shiitake Mushroom Soup ($8). Unlike the other mushroom soups, it is made from dried shiitake mushrooms, in which the expectations should be having a stronger or even pungent smell compared to fresh mushrooms. However, it turns out that aroma are surprisingly pleasant and tasted better than fresh mushroom soup. During the rehydration process, the mushrooms are roasted with onions, which remove the pungent flavour and infused delicate sweetness to this dish. Butter, cream, salt & pepper are added and it produce a delicious bowl of creamy mushroom soup. Yum Yum. Moving to the main meal, diners can have the freedom to have it individually or sharing with as dishes with rice or maybe a tapas style. Har Cheong ($13). Chef Nixon's Singapore answer to Cordon Blue Chicken. Chicken thigh marinated with shrimp paste for 6 hours, roll into roulade, steamed, battered and fried till crispy. Served with calamansi mayo and calamansi. It has a unique crispy exterior with succulent, har cheong flavour thigh. Interesting dish but I find the batter tasted more like fish and chips batter instead of har cheong. I still prefer my har cheong with actual crispy chicken skin. 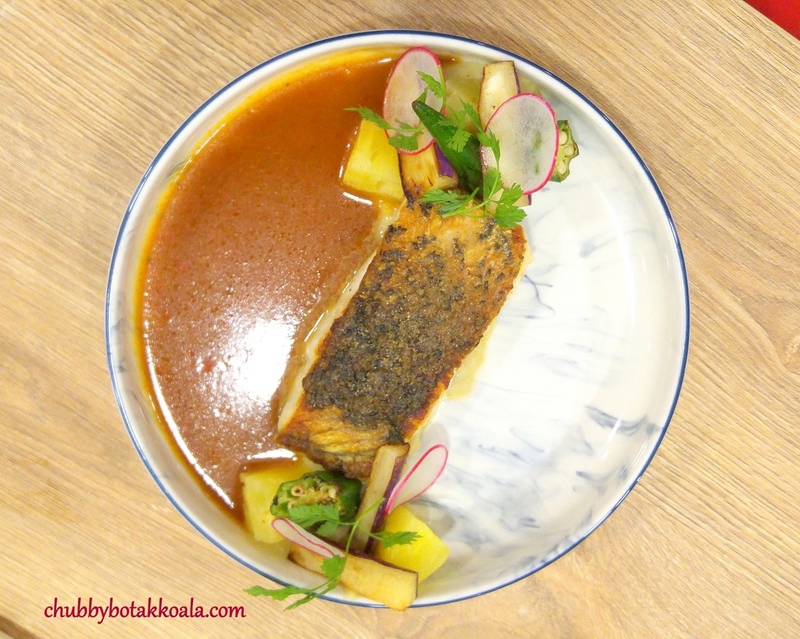 “Assam” Pulau Ubin Seabass ($15). A deconstructed assam fish dish. The seabass came from the local fish farmer, seared until the skin is crispy. Accompanying the assam fish, there are the lady fingers, pineapples, and eggplant. All of these ingredients are plated at the centre of the flat bowl, on top of eggplant purée. An interesting way of plating the fish, where one side of the plate are filled with assam gravy, while the other side is empty. Kind of like the symbol of Ying Yang. Although each ingredient is separated, when you eat it together it blend just nicely. Instead of getting a mushy texture in your zi char assam fish, you get crispy, crunchy and moist texture cooked perfectly. Yum Yum. Charcoal Katarosu Pork Collar ($16). Inspired by coffee pork ribs. The pork collar is seared and smoked in charcoal, served with Kopi C sauce and Coffee soil. The pork collar is tender and succulent, with a subtle seasoning. Once you combine the pork collar with the soil, it added the sweet, caffeinated flavour and crunchy texture to the dish. I find that if they can intensify the charred aroma, it will give this dish the edge of Kopi feel. “Ang Ji Kao” Stout-Braised Beef Cheek ($17). Inspired by Guinness Stout and roasted peanuts from a drinking session. Beef cheek braised in stock for 24 hours. Served with peanut butter crunchy mash and fresh Nasi pear. The melt in your mouth beef cheek, with subtle flavour of stout. The roasted peanut mash is unique and creamy, remind me of peanut butter sauce that I had before in my Uni days. There are whole roasted peanuts with mash, to give it a crunchy texture to the dish. The Nasi pear is relatively mild to have much effect on this dish. A good dish to have with your steam or boiled vegetables. To accompany the main dishes, you can choose your preferred grains such as brown rice, calrose white rice, couscous or quinoa barley. All for $3 per serving. For dessert, we tried Milo Dinosaur ($8). Milo panna cotta with Milo crumbs and Japanese rice balls. A must try desserts, where the flavour is well-balanced. You have the rich malt chocolate flavour in the wobbly panna cotta, and it matches my taste buds as it is less sweet. The homemade milo crumble is just crunchy and addictive, while the plain Japanese rice ball looks like dinosaur eggs ready to hatch. Kudos to the Chef who are able to interpret this Singaporean dessert so uniquely. 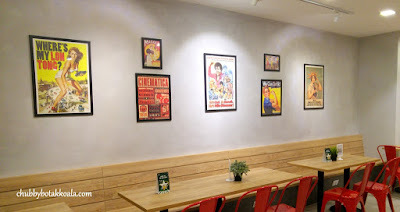 Decor of the restaurant is Modern X Retro. 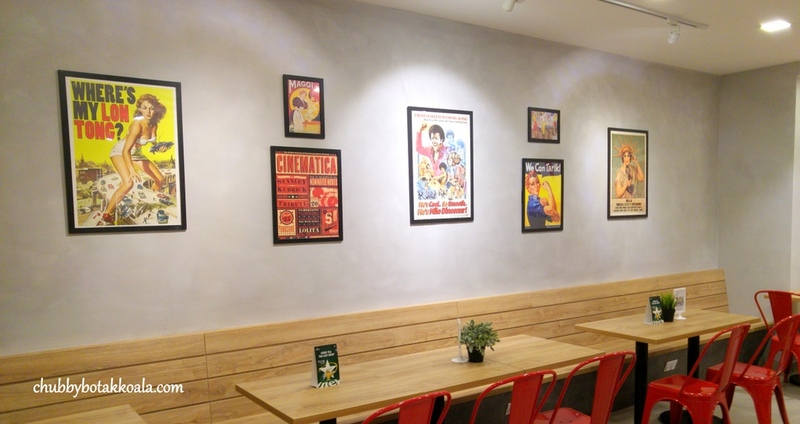 Tables and Chairs are modern, while the walls are decorated with the mix of retro pictures and graffiti work by a local artist. There are 2 more walls still empty, but don't expect it to remain “kosong” too long. The lightings are bright, perfect for those Instagram photos. Overall, it was a pleasure seeing Chef Nixon Low again. His creations of Modern Singapore Cuisine definitely display a lot of his creativity in combining traditional local flavours with modern cooking techniques. The best part is that most of the dishes hits the spot and has its own unique characteristic. Definitely, a place to try. Cheers!! Thank you very much to Jiakpalang Team for the tasting invitation.